A flag contest was held. We do know that flags for all emblems exist, as the legal frame is the same for both kinds of symbols. 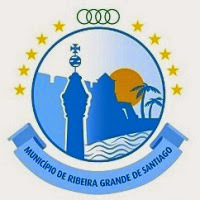 The municipal emblem of Ribeira Grande de Santiago includes the usual round shield filled up with a distinctive motif: The central motif shows a scene with sunset (or sunrise) over local landmarks (fortress and pillory?) and two palm trees, everything in grades of lightest blue and white, the sun a golden yellow disc. This motif on the circular shield of the municipal emblem seems to be an adaptation to the generic design of caboverdean municipal emblems of a pre-existing, free style logotype, also see in (maybe official?) use. This round emblem is surrounded above by the ten stars in two arcs with a chain segment at the apex, here of three (some times four?) green links, and below by a toponimic scroll, blue — sometimes curved, others straight, sometimes reading "MUNICÍPIO DE RIBEIRA GRANDE DE SANTIAGO" in black serifless capitals, others "RIBEIRA GRANDE DE SANTIAGO" in blue serifless capitals above "Cidade Velha - Berço da Nação Caboverdiana" set in smaller, black serifless letters. This thus named is on Santiago Island; not to be confused with Municipality of Ribeira Grande, on Santo Antão Island.